Dr. Harriet Feilotter’s research focuses on the implementation of biomarkers to be used in the screening, diagnosis or treatment of human diseases, including cancer. Using her dual role as a researcher in Pathology and Molecular Medicine, and service chief of laboratory genetics at the Kingston Health Sciences Center, her research is geared towards clinical applications of targeted biomarkers. Her research includes the study of DNA, RNA and protein biomarkers in a variety of diseases including breast, lung, melanoma, bladder and colon cancers. Feilotter’s lab makes use of multiple platforms, including massively parallel sequencing, to generate and validate targeted biomarker data. Her primary focus is in developing and standardizing pathways for the effective implementation of robustly evaluated biomarkers in the clinical setting, including the assessment of quality metrics. To that end, she engages in community ring studies to assess methodology for evaluation of analytic parameters for targeted molecular assays. 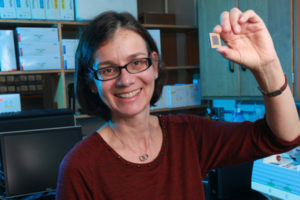 Due to the networked nature of the work, she also has an interest and focus in informatics, including the proper handling, storage and sharing of biomarker data, the preprocessing pipelines required to ensure high quality data, the analytic pipelines needed to deliver an effective clinical tool and the ability to federate multiple types of data into formats suitable for sharing, querying and storing. Vaughn C, Costa J, Feilotter HE, …, Laurent-Puig P. Simultaneous detection of lung fusions using a multiplex RT-PCR next generation sequencing-based approach: a multi-institutional research study. BMC Cancer. 2018; 18:828. Bradbury P, Morris D, Nicholas G, …, Feilotter HE, Seymour L, Laurie S. Canadian Cancer Trials Group (CCTG) IND211: A randomized trial of reolysin in patients with previously treated advanced or metastatic non-small cell lung cancer receiving standard salvage therapy. Lung Cancer. 2018; 120: 142-148. Jonker D, Tang P, Kennecke H, …, Feilotter H, …, Seymour L. A Randomized Phase II Study of FOLFOX6/Bevacizumab With or Without Pelareorep in Patients With Metastatic Colorectal Cancer: IND.210, a Canadian Cancer Trials Group Trial. Clin Colorectal Cancer. 2018;17(3):231-239.e7. Eigl B, Chi K, Tu D, …, Feilotter HE, Theis A, Seymour L. A randomized phase II study of pelareorep and docetaxel or docetaxel alone in men with metastatic castration resistant prostate cancer: CCTG study IND 209. Oncotarget. 2018;9(8):8155-8164. Manley P, Abu-Abed S, Kirsch R, …, Feilotter H, …, Walia J. Familial PDGFRA-mutation syndrome: somatic and gastrointestinal phenotype. Hum Pathol. 2018;76:52-57. Bernstein V, Ellard S, Dent S, …, Feilotter H, Hagerman L, Seymour L. A randomized phase II study of weekly paclitaxel with or without pelareorep in patients with metastatic breast cancer: final analysis of Canadian Cancer Trials Group IND.213. Breast Cancer Res Treat. 2018;167(2):485-493. Lebo M, Zakoor K, Chun K, …, Feilotter HE, …, Lerner-Ellis J. Data sharing as a national quality improvement program: reporting on BRCA1 and BRCA2 variant-interpretation comparisons through the Canadian Open Genetics Repository (COGR). Genet Med. 2018;20(3):294-302. Wang A, Ramjeesingh R, Chen C, …, Feilotter HE, Davey, S. Reduction in membranous immunohistochemical staining for the intracellular domain of epithelial cell adhesion molecule correlates with poor patient outcome in primary colorectal adenocarcinoma. Curr Oncol. 2016;23(3):e171-8. Abraham KJ, Zhang X, Vidal R, …, Feilotter HE, Tron VA. Roles for miR-375 in Neuroendocrine Differentiation and Tumor Suppression via Notch Pathway Suppression in Merkel Cell Carcinoma. Am J Pathol. 2016;186(4):1025-35. Dos santos vidal R, Hawrysh A, Walia JS, …, Feilotter H. Eligibility Criteria and Genetic Testing Results from a High-Risk Cohort for Hereditary Breast and Ovarian Cancer Syndrome in Southeastern Ontario. J Mol Diagn. 2016;18(3):362-369. Mangone FR, Miracca EC, Feilotter HE, …, Nagai MA. ATM gene mutations in sporadic breast cancer patients from Brazil. Springerplus. 2015;4:23. Feilotter HE, Michel C, Uy P, Bathurst L, Davey S. BRCA1 haploinsufficiency leads to altered expression of genes involved in cellular proliferation and development. PLoS ONE. 2014;9(6):e100068. Geraci J, Dharsee M, Nuin P, …, Feilotter HE, Evans K. Exploring high dimensional data with Butterfly: a novel classification algorithm based on discrete dynamical systems. Bioinformatics. 2014;30(5):712-8. See Dr. Feilotter’s recent publications on PubMed. To collaborate with Dr. Feilotter, please contact her directly. Visit OICR’s Collaborative Research Resources directory for more opportunities to collaborate with OICR researchers.